As a young boy I remember seeing a lot of John Wayne movies in the 1960s, but one I don’t recall is The Man Who Shot Liberty Valance. I do remember the identically named Gene Pitney song, though it was not actually used in the picture. If I did see the movie, it probably didn’t strike me at the time as it was filmed in black and white and didn’t have the grand Technicolor landscapes that were such an integral part of the westerns I recall. With screen giants John Wayne as rancher Tom Doniphon, Jimmy Stewart as newly arrived eastern lawyer Ransom Stoddard and Lee Marvin as the delicious villain Liberty Valance, the film was loaded with star power, but the character actors were equally delightful. They included Andy Devine as the atypical portly and nervous town marshal, Strother Martin as Valance’s delightfully obsequious sidekick, and Edmond O’Brien as Dutton Peabody, the pompous and tipsy editor of the Shinbone Star. One of my favorite move exchanges ever, again because of its juxtaposition of myth and reality, is journalist Peabody’s protest against his nomination to a political post. Peabody (O’Brien): Good people of Shinbone, I, I’m your conscience; I’m the small voice that thunders in the night; I’m your watchdog, who howls against the wolves. I, I’m your father confessor! I, I’m … what else am I? In many ways, The Man Who Shot Liberty Valance is an elegy to the passing of the Old West, the conflict between the past as represented by both Doniphon and Valance and the future as represented by Stoddard, whose gunfight with Valance wins him the girl, Vera Miles in this case, and ultimately earns him a seat in the U.S. Senate. One of John Wayne’s most powerful acting scenes, ranking right up there with some of his scenes in The Searchers, comes when he explains what really happened the night Liberty Valance died. All was not as it seemed that night, and reputations were made and lost as a result. 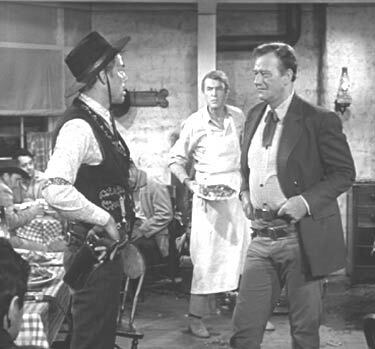 Directed by John Ford, The Many Who Shot Liberty Valance is considered by some critics as one of the first revisionist westerns because it upended the traditional cliché of the mano-a-mano showdown. If it is indeed a revisionist western, it is one with more heart and less bile than in most revisionist westerns. The film was added to the National Film Registry by the Library of Congress in 2007 because of its cultural significance. It’s worth seeing again.